TomTom perfectly timed the launch of its first foray into the golf wearables world, with the TomTom Golfer getting an official unveiling on the day the Ryder Cup kicked off back in September 2014. The company has had a busy year, and has just taken the lid off the TomTom Spark running watch too, which shows how serious it's getting about wearables and sports. And its founder, Peter-Frans Pauwels told Wareable just as much in a recent interview. A wet winter limited our opportunities to get hands-on with the latest member of the TomTom MySports family but, after a few rounds (and more shots over par than we'd care to admit), we think we're ready to deliver our TomTom Golfer verdict. Taking on the Garmin Approach range, the TomTom Golfer is a GPS connected watch that offers the usual array of golf wearable features. Pound-for-pound, it's probably most similar, feature-wise, to the Garmin Approach S3, with a touchscreen and custom pin positioning the only major features missing. However for $50 less – the TomTom Golfer is $249 – we think the satnav specialist is onto a winner. The Golfer's main features, when out on the course, are the GPS-powered distances to the front / middle / back of the green, distances to hazards, doglegs and lay-ups, a green view (with hazard warnings), and a digital scorecard. For an average golfer looking to get a bit more from his or her game, there's not a lot else you'd really need. You kick-start the golf mode simply by tapping right on the navigation button (more on that later) and a search for your course begins immediately. With GPS and GLONASS on board, it doesn't take long to get a signal locked in and, once you've confirmed the course you're playing, things happen automatically. The TomTom Golfer will recognise what hole you're on, with the shot distances changing automatically as you walk towards your ball and, 90% of the time, it will switch to the next hole without you having to do anything. Occasionally, if the tees for the next hole are very close to the green of the last, it can get a bit confused as to whether you've finished your hole or not. If this happens you simply need to tap up to select the next hole. The distances to the green are given in yards or metres (it's simple to change this in the settings) and are presented in an incredibly clear way on the main 'in-action' homescreen. Scrolling right from this screen presents you with an array of extra info, turning the TomTom Golfer into a basic caddy for your wrist. You'll see a graphical representation of the hole, with hazards plotted against a yardage chart, a detailed view of the green (with shape and bunker positions), a lay-up guide if you don't feel like channelling your inner Rory, and details of any doglegs your hole contains. Doglegs are also indicated on the main yardage homescreen by way of an arrow pointing left or right. It's a simple setup, incredibly easy to navigate and the only thing that's really missing is the ability to move the pin position on the virtual green view. Golf mode also keeps track of your round time, the distance you travelled and an estimate of your calorie burn. This is all useful, if somewhat unnecessary info – but we suppose there's no point in including it. The final aspect of golf mode is a digital scorecard. It's not automatic, you'll have to enter your stroke count manually after each hole, but it's a cinch to do and you're presented with your stroke play score and your position against par. Stableford points would be a nice addition but having to work these out manually at least you'll have an excuse to head into the 19th for a pint afterwards. It's pretty easy to accidentally leave your round, either by tapping back one screen to far, or simply by accident when pulling balls and tees out of your pocket. Fortunately, there's a resume round option, although this does reset the timer and distance count. The TomTom Golfer pairs up to the MySports desktop software and either an iOS or Android app. In theory, at least – it's a bit of a pickle if we're honest. 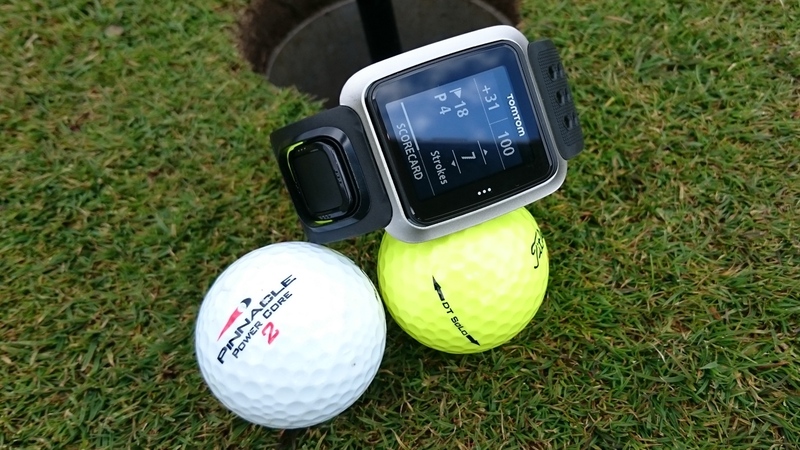 Firstly, you'll need to tether your Golfer to your PC or Mac to make the initial sync to the TomTom servers and get the watch's software build and course details up to date (of which it has the details of over 34,000). But then neither the desktop software nor the online portal will give you any details of your synced scorecards. For that info, you'll need to Bluetooth sync to your TomTom MySports smartphone app – easier said than done. We tried to sync the watch to a couple of Android devices, with no luck. Things were a little smoother on iOS thankfully. Once you have synced with your smartphone, there's no need really to every tether to a PC again – the app is able to update course info if necessary. Unlike the high-end Garmin golf watches there is no colour display on the Golfer, although the 1.3-inch, 168 x 144, monochrome screen does offer a bright, easy to read, display and there's a backlight on board for twilight rounds. It's not a touchscreen – navigation is done using a square button below the screen with up, down, left and right controls. It's an easy to use system; basic but effective. At 11.5mm thick and weighing around 50g, the TomTom Golfer is slim line and lightweight and we've absolutely no complaints at all when it comes to comfort on the course. With a 10-hour battery life, it should have enough power for back-to-back rounds and if it rains, no worries – the Golfer is 5ATM water resistant. Charging is made easy with a dongle that doubles up as a desk stand for the watch. When you're not in golf mode (i.e. when GPS isn't switched on) you'll get days of life as a regular digital watch. The TomTom Golfer is a fantastic device for average golfers, and maybe even low-handicappers looking for an extra edge on the course. Yes, there are far more feature packed golf watches out there but, priced at less that £200 / $250, the Golfer represents brilliant value for money and ticks all the boxes for the must-have functions. The app and software side is a little bit sloppy and it’s a shame it’s so easy to accidentally quit your round but, overall, TomTom’s first shot at wearable golfing success has to be applauded. It's not quite a hole-in-one but it's definitely under par. (This is golf, under par is good...keep up).